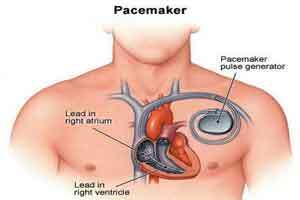 There’s good news for people with pacemakers and the doctors who treat them. A new study reinforces earlier work suggesting that MRI scans are safe for patients with older devices, even if the MRI is focusing on the chest area. Until now, the sensitive electronics of older pacemakers and implantable defibrillators were thought to be vulnerable to disruption when subjected to the magnetic fields and radio waves that allow magnetic resonance imaging, or MRI, to see into the body. The new study in The New England Journal of Medicine “confirms that pretty much anybody who has a pacemaker or implanted defibrillator can, with very few restrictions, safely get an MRI scan if they need it,” as long as the devices are properly adjusted before the scan and safeguards are in place, coauthor Dr. Henry Halperin, professor of medicine, radiology and biomedical engineering at Johns Hopkins University in Baltimore, told Reuters Health in a telephone interview. To prevent problems, the researchers reprogrammed the devices to adopt a standard heart rhythm for people whose hearts won’t beat on their own and disabled functions that might cause the pacemaker to fire improperly if the MRI produced erratic signals in the heart. After the MRI, the devices were returned to their original settings. Only newer devices designated as “MRI-conditional” have been considered safe by the U.S. Food and Drug Administration. The vast majority in use – about 6 million worldwide – do not have that designation. A 2005 analysis estimated that at least half of those patients will someday need an MRI. The U.S. Centers for Medicare and Medicaid Services (CMS), which administers the Medicare insurance program for the elderly and disabled, will only pay for MRI scans in patients with “MRI-conditional” devices, coauthor Dr. Saman Nazarian, of the University of Pennsylvania Perelman School of Medicine, told Reuters Health in an email. Given the results of the new study and an earlier one published in February, which also showed the older devices to be safe, “it’s hard to understand the position” of the CMS, said Nazarian, a cardiac electrophysiologist. In that February study, a separate team of researchers reported in The New England Journal that no serious problems were seen in 1,318 patients with a pacemaker or implantable defibrillator who received an MRI. But in those cases, the chest area wasn’t scanned by the MRI. In the new tests by the Nazarian-Halperin team, about 200 of the 1,509 pacemaker and defibrillator patients had their chest scanned with a 1.5 Tesla MRI. Neither the chest scans nor the scans done elsewhere in the body produced significant problems, said Dr. Halperin. Nine of the devices were disrupted but reset themselves to a backup mode. In all but one case, the effect was temporary. There was one instance where the device had to be replaced, but it had a low battery and could not be properly reprogrammed. In five instances, doctors halted the MRI exam. In one case, the heart rate fell to under 40 beats per minute. In another, the patient’s heartbeat became too rapid. In the remaining three, the doctors decided that an MRI probably wouldn’t produce a useful image anyway.